My Yule Ritual Box from Wicca Moon arrived in the post yesterday - and the box was so large that I didn't guess what it was inside until I had opened it up. I thought maybe someone had sent me an unexpected box of books, it was so big and heavy. As much as I like books, what was in the box - all wrapped in gold tissue - was much more exciting than some reading material. Just look at the picture above! It really felt as though my Christmas had started. 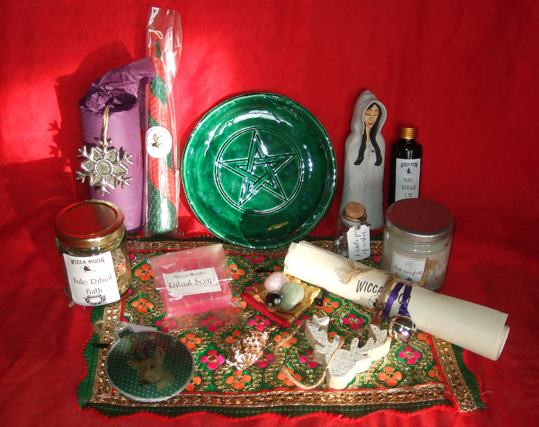 Pagan supply shop Wicca Moon is at 50 Well Hall Road, Eltham, London, SE9 6SH. The staff are very happy to help, so if you have any questions, do pop in or phone them on 020 8850 7803.